Jallikattu is a bull taming sport played in Tamil Nadu as a part of Pongal celebration. This is one of the oldest living ancient sports seen in the modern era. Although it sounds similar to the Spanish running of the bulls, it is quite different. In Jallikattu, the bull is not killed and the 'matadors' are not supposed to use any weapon. It is held in the villages of Tamil Nadu on the eve of Mattu Pongal, one of the four days of Pongal festival . The one held in Alanganallur, near Madurai, is the most popular. This sport is also known as "Manju Virattu, meaning "chasing the bull. In Jallikattu, an agitated bull is set to run in an open space. Several people, empty handed, try to tame it by controlling its horns. The winner gets a prize, which is generally tied to the horns of the bull. Only men take part in this game. Sometimes, more than one bull is let loose at the same time. Jallikattu, which is bull-baiting or bull fighting, is an ancient Tamilian tradition, popular amongst warriors during the Tamil classical period. According to legend, in olden days the game was used by women to choose their husbands. Successful "matadors" were chosen as grooms. The term Jallikattu comes from the term "Salli" kassu and "Kattu" tied to the horns of the bulls as the prize money. Later days during the colonial period this term got changed to Jallikattu which is the term currently used. Usually the majestic Kangeyam bull is involved in this game, as they are naturally more ferocious and muscular than any other of its species. 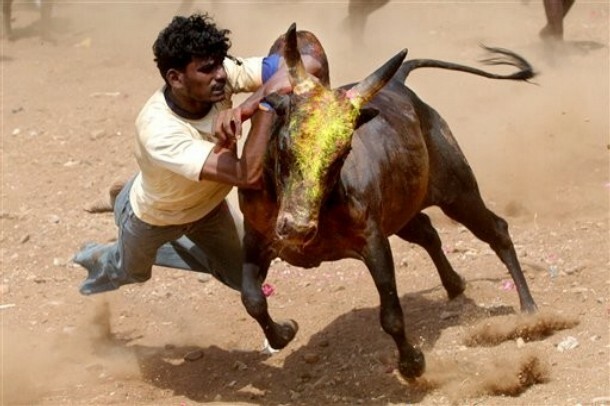 As might be expected, injuries and even deaths occur in Jallikattu. In 2004, at least 5 people were reported dead and several hundreds injured in various villages. Two hundred have died over the past two decades. Unlike in bullfighting, the matador does not kill the bull. There are rarely any casualties suffered by the bulls. Several animal activists object to this dangerous game every year, but so far these objections have been in vain. In fact Jallikattu is loaded against the matadors, unlike in European bullfighting. For instance, the bull's horns are sharpened and the matador cannot use any weapons. There are several rock paintings, more than 3,500 years old, at remote Karikkiyur village in the Nilgiris district in Tamil Nadu that show men chasing bulls. Kaikkiyur, situated about 40 km from Kotagiri town, is the biggest rock art site in south India. The rock surface site, teeming with more than 500 paintings, was discovered by K.T. Gandhirajan, art historian, Prof. G. Chandrasekaran, Principal of the Government College of Fine Arts in Chennai and others in 2004. Another single painting discovered in a cave at Kalluthu Mettupatti, about 35 km west of Madurai, between Madurai and Dindigul, shows a lone man trying to control a bull. Mr. Gandhirajan estimated that this painting, done in white kaolin, was about 1,500 years old. The event has fascinated movie makers for decades. Several movies featuring Jallikattu have been made in Tamil. The most popular among them is Murattu Kalai starring Rajinikanth playing the role of a professional and the most successful bull tamer of the village. Virumandi, released in 2004, had Kamal Haasan playing a more effective role, and offered the most realistic depiction. He is also known to have acted without stunt doubles.